Just 150 metres from the private beach, Lemon Villa Boutique Hotel has a small garden. Wi-Fi is available in all areas and is free of charge. Hotel Lemon Villa’s wooden-floor units feature air conditioning, flat-screen satellite TV and a private bathroom with a shower, hairdryer, slippers and free toiletries. Some units also have a balcony. Bicycle and car rentals are possible upon request. Laundry, dry cleaning and ironing services are also available at an additional fee. You can enjoy traditional breakfast in room. There is also an à la carte restaurant, which you can have lunch and dinner. Special diet menus can be prepared upon request. 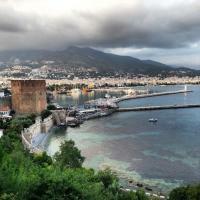 Alanya Harbour and historic Alanya Castle is within a walking distance. Shuttle services to Antalya Airport, which is 125 km away, are arranged at a surcharge. Centauera boutique hotel in the center of Alanya , Alanya peninsula, with the date on which a unique aesthetic Tophane nostalgic texture beldemizdeki first boutique hotel opened in May, 2011 . Which today makes up the foundation stage of our business to the satisfaction of our valued guests thought all of the details . Our hotels ' Adult -time only as' structured . The most important reason is the fact that the present form from the restoration of an ancient fishing house . Rooms All rooms with floor plans may vary , Air conditioning, Television , Telephone, Wireless Internet Access , Satellite broadcasting (All Country National TV ) , Mini Bar, Safety Deposit Box, 24-Hour Hot Water , Shower, Hairdryer, Room Service, Wake-up service, Ironing Service provides service . Four of the rooms have a sea view 5 of the total number in the tub is also available in the room . Akdenizin incisi, Alanya merkeze 12 km mesafede yer alan Villa Augusto Boutique Hotel & Spa' da romantik, huzurlu, sakin bir tatil sizi bekliyor. Bahçe kapısından geçtiğiniz andan itibaren farkındalığı hissetmeye başlıyorsunuz. 2 katlı binamızda deniz, havuz, bahçe ve cadde manzaralı, grand suit, suit, standart balkonlu ve balkonsuz toplam 20 odadan oluşmaktadır. isterseniz deniz suyu yarı olimpik yüzme havuzumuzu kullanabilir, isterseniz yürüme mesafesi 2 dakikada denize ulaşabilir, muhteşem butik bahçemizde güneşlenerek deniz ve havuzun tadını çıkarabilirsiniz. Türk hamamı ve spa da uzman masör ve masözlerden yorgunluğunuzu unutturacak masajlar alırken zamanın nasıl geçtiğini unutacaksınız. Güler yüzlü personelimiz ve misafirperverliğimizle siz değerli misafirlerimize '' anılarınızdan silinmeyecek an'lar '' yaşayacağınız rüya gibi tatiller sunuyoruz. Located in the heart of the Alanya Castle, a romantic boutique hotel featuring a beautifully restored 19th century castle mansion with 11 individually decorated rooms and an organic cousine.